A charge controller, or charge regulator is a device that prolongs battery life by keeping batteries from overcharging. 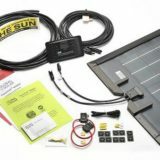 It controls the voltage and current coming from solar panels before going into the battery. 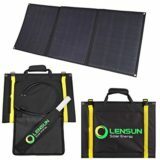 Most common solar panels supply between 14 to 20 volts even if they are labeled as 12 volts, so if no charge controller is present the batteries can be damaged from overcharging. Most batteries need around 14 to 14.5 volts to become fully charged. Is a charge controller always needed? Not all the time, but usually. Generally, there is no need for a charge controller with trickle chargers or smaller panels like 1 to 5 watts. 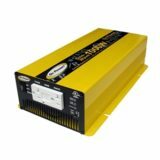 A general rule is that if the panel puts out 2 watts or less for each 50 battery amp-hours, then you don’t need one. The obvious question then comes up – “why aren’t panels just made to put out 12 volts”. 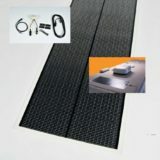 The reason is that if you do that, the panels will provide power only when cool, under perfect conditions, and full sun. The reason why they supply more than their stated voltage is so they can supply power in all conditions. If a panel was made to only supply power in 12 volts it would only work in “perfect” laboratory conditions. This doesn’t generally happen in the real world, and panels have to account for this. Some things that limit the production of energy in your panels are things such as high temperatures, cloudy overcast days, or the position of the winter sun. Today’s solar panel needs to provide some extra voltage so you still receive some output when these “real world” scenarios occur. 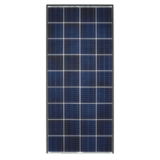 Most PV panels that rated over 140 watts are NOT standard 12 volt panels, and should not be used with a standard charge controller. Voltages on higher wattage panels can vary quite a bit, and can range from 20 to 60 volts. Some are standard 24 volt panels, but many are not. 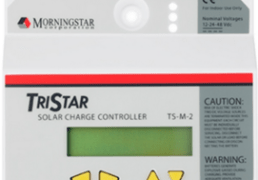 A standard controller ( all but the MPPT variety), can most often work with higher voltage panels if the charge controllers maximum input voltage is not exceeded. However you will lose a large portion of power. You can lose anywhere from 20 to 60% of a panels stated power output just by not using a MPPT controller. 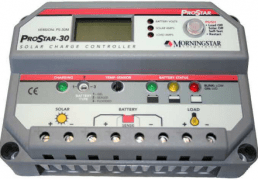 A standard charge controller takes the current from your panels and directs it into your batteries until they are fully charged. 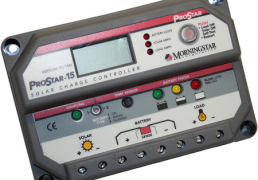 While the charge controller reduces the voltage to an appropriate level for your battery, the amps from the panel can not exceed its rated amperage. So if you have a 140 watt panel rated at 21 volts/6.7 amps, you would only receive 6.7 amps @ 12 volts into the battery. Ohms law states that watts equal volts x amps so your 140 watt panel would only put 80 watts into your battery! 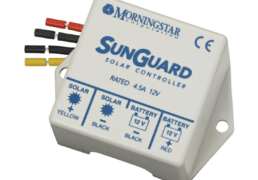 Using an appropriate controller is absolutely necessary to ensure that you get every dollar out of your solar investment. Charge controls come in many sizes, shapes, features, and price ranges. They can range from the small 4.5 amp control, up to the 60 to 80 amp MPPT programmable controllers with digital display. If currents over 60 amps are needed, two or more 40 to 80 amp units can often be wired in parallel. 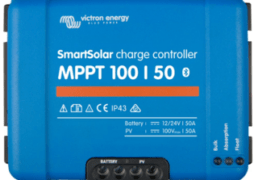 Most often controls used for battery based systems are in the 4 to 60 amp range, but some of the newer MPPT controls example can go up to 80 amps. Basic 1 or 2 stage controls which depend on relays or shunt transistors to manage the voltage in one or two stages. These basically just disconnect or short the solar panel when a specific voltage is reached. These controllers are of the older variety but they can still be found on older systems and are rather inexpensive. Because they have so few internal components they are somewhat reliable as there is not that much to break. PWM and or 3-stage such asXantrex, Morningstar, Blue Sky, and many others. These represent the industry standard nowadays, but you will still see some of the older shunt/relay types around, such as in the cheaper systems offered by various discounters. Maximum power point tracking (MPPT), such as those made by Xantrex, Midnite Solar, Outback Power, Morningstar and others. These are the cream of the crop in charge controllers. They have efficiencies within the 94% to 98% range. Since they provide 10% to 30% more power to the batteries, you can expect to pay more for these units as they are top of the line and can save you a noticeble amount of money on some of your larger systems. Most of these controllers will come with some type of indicator, either a simple set of LED’s or digital meters. Many of the newer ones, such as the Outback Power, Morningstar MPPT, and others now have built in computer interfaces for control and monitoring. The most simple ones will usually have only a couple of small LED lamps, which indicate that you have power and that your battery is charging. Most of those with meters will show you voltage and current output from the panels and the battery voltage. Many charge controls have a “PWM” mode. PWM stands for Pulse Width Modulation. Instead of a constant output from the controller, it sends out a series of small charging pulses to the battery – a very fast “on-off” switch. The controller is constantly checking the status of the battery to determine how quick to send pulses, and how long (wide) the pulses should be. A completely charged battery with no load will just turn on every few seconds and send a short pulse to the battery. In a discharged battery, the pulses can be long and almost continuous, or the controller may go into “full on” mode. The controller is constantly checking the charge of the battery in between pulses and automatically adjusts itself during each time. One downside to PWM is that it can create interference in radios and TV’s due to the rapid pulses that it generates. What are the “Sense” terminals on my controller? Some charge controllers have a pair of “sense” terminals. These terminals carry very low current, so there is no voltage drop, usually around 1/10th of a milliamp at most. These terminals compare the batteries voltage to what the controller is putting out. If there is any voltage drop between the two, it will increase the controller output very slightly. Generally these are used when you have a long wire run between the battery and the controller. These wires carry no current, and can be small #20 to #16 AWG. They attach to the SENSE terminals on the controller, and onto the same terminals as the two charging wires on the battery. What is a “Battery System Monitor”? These monitor your battery system and provide a pretty good idea of what your battery condition is. They tell you what you how much your using and generating. They keep track of amp-hours that are going into and out of the batteries, and the batteries state of charge, and other info. They are very useful for medium to large systems for tracking what your system is currently doing. They maybe somewhat overkill for smaller systems, but are useful if you want to see what every amp is doing.